I bet you’re wondering where I’m going with this. I mean, we’ve all been spectators at some point in our lives – and I mean the kind of spectate-ing where you’re watching a friend or family member perform, compete, exhibit, or otherwise publically make use of a skill set or talent that you do not possess and most likely wouldn’t even know about if said loved one didn’t inspire your interest. For instance: I love college football games. As in Love. If I had a friend or family member playing for my team, and they requested that I come out to support them, I wouldn’t even have to change my plans because I’d probably already be there anyway. But it’s a little different when your loved one has a passion for something that, while you can appreciate their enjoyment, you don’t necessarily want to join the team yourself. I’ve mentioned my husband’s hobby to you before – he has a real passion for going fast, more specifically on motorcycles. 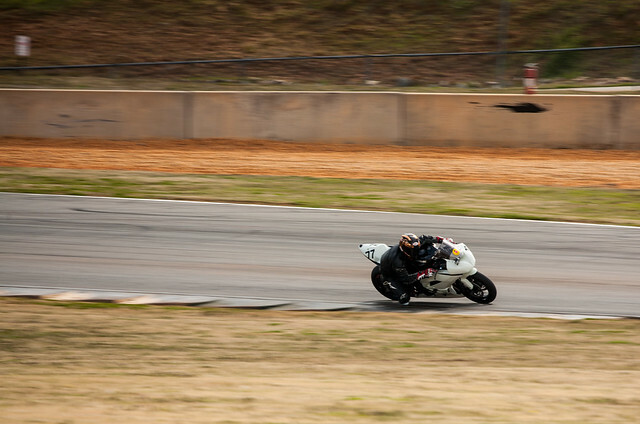 He participates in motorcycle Track Days, which are sponsored by various groups, such as NESBA or STT. 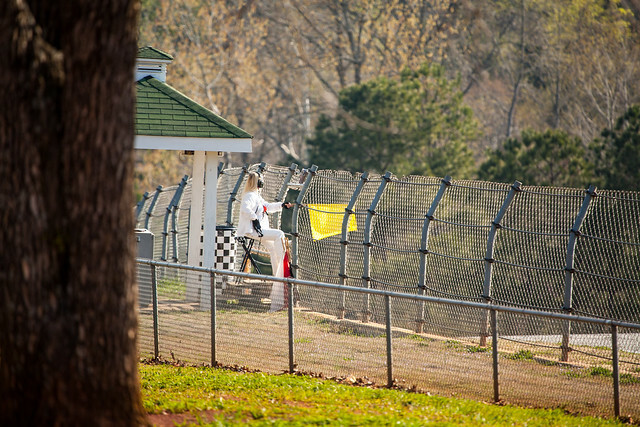 In short, the race tracks that are uber-appealing to motorcycle riders (Road Atlanta, Barber Motorsports Park, etc) are available to be rented out for weekends when they aren’t hosting races or events, but the prices are so high that it wouldn’t be practical for an individual. So the riding organizations rent the tracks and then sell riding privileges at prices that are much more accessible to the masses. It’s actually a really great environment for the riders – they get to talk shop all weekend with like-minded enthusiasts, and they get to ride really fast in a safe situation. 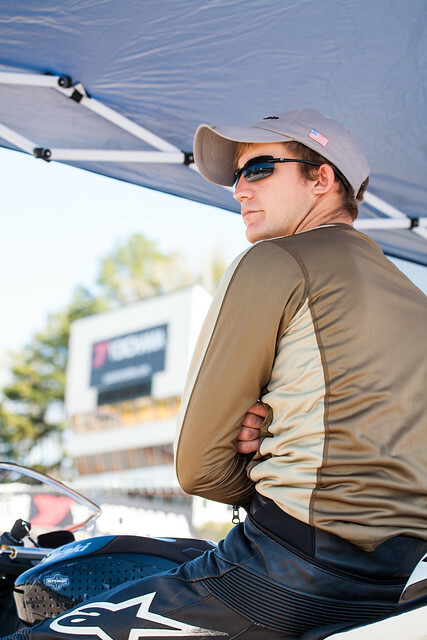 Jacob is totally in his element at track days – he loves to ride, and he’s really good at it. Me, not so much. I’m an excellent passenger, and I love to ride with him (at a more sedate pace, of course), but at track days, I don’t really have a role. I can help unpack the trailer and set up our canopy and such, but besides that there’s not much for me to do unless I want to get on a bike myself. And it’s not the most spectator friendly sport – the tracks are made to be like a winding road, so they go through wooded areas, up and down hills, under bridges… If there is a viewing area, you may see the riders coming for a moment, and then zoom they’re gone. After we had attended a couple of track days and I got over the excitement of seeing something brand new, I started to get a little, well, bored. I really love to see Jacob having so much fun, and I love that he wants to share this experience with me, but it doesn’t change the fact that while he’s out there riding, I’m just standing around watching him whoosh by once every two minutes or so. After nearly three years of attending track days, I realized that I sort of made my own role so that I could be there to support Jacob, and at the same time stay interested and engaged in the activity. I would guess that a fair number of you have friends or loved ones with a hobby that you don’t, or can’t, share a passion for. And it can be hard to show enthusiasm when you’re just not having as much fun as someone else. I’ve made a list of a few tips that helped me in just that situation, and I’m passing them on the hopes that some of you may be able to find a little more enjoyment in being a spectator. Get involved! What do you love to do? Is there some way that you can incorporate your hobby into your loved one’s activity? I love photography, so I started bringing my camera along to the race track, and now I look forward to track days almost as much as Jacob does. I was able to learn a whole new style of taking pictures – there’s nothing like trying to get a perfectly sharp photo of someone who is zooming by you at 150mph to make you really good at sports photography. But maybe you love to cook, and you could provide snacks; or you’re a born leader and have some ideas for improving the event. Join the group or committee that runs the event and give yourself a reason to be invested in the activity. You’ll find that both you and your loved one will enjoy it more if you’re enthusiastic about being involved. Bring a friend. I had so much fun at the first track day we attended, but after the new wore off, my interest started to wane. When we had friends join us for a weekend, I was able to show them the ropes and explain things, and it was a lot of fun watching someone else experience it all for the first time. And it never hurts to have someone around to talk to in a slow moment. Do some research. Take some time to learn a little bit about the sport or activity that you’ll be attending. If you don’t know the rules it’s hard to follow the action, but also, just knowing some background information can help you become involved in the conversations around you. I’m fairly knowledgeable about motorcycles at this point, because Jacob is so into them and I like to talk to him about it. So when we’re at the track and I’m standing there with five or six riders all going on about their steering dampeners, or their rear suspension, or the particular tire compound they’re running that day I can at least follow the conversation, and even join in occasionally. Make an effort. This one is really important. And it may be the hardest thing to do. I know how hard it is to try to be enthusiastic about something that you could care less about – but that’s the thing isn’t it? You clearly do care about your friend or family member that you’ve gone out the support, or you wouldn’t be there in the first place. But it takes real effort to find some enjoyment for yourself in the midst of being supportive. You have to look for a way to involve yourself. You have to entertain that friend that you invite along. You have to be friendly and sociable to strike up a conversation with a stranger, and you may have to step outside of your comfort zone to engage a stranger in conversation in the first place. But that small effort may open up a new door for you – you may find a new hobby for yourself, or make a new friend, or reconnect with an old one. If nothing else, you’ll probably learn something new, and you may even find an interest where you didn’t know you had one. The fact is, a good attitude can go a long way. If you open your mind to the possibility of a good time you’ll be much more likely to find one. So try to keep a positive attitude, dear readers, and if all else fails, bring a good book and a [insert beverage of choice] and you’ll be just fine. I was so unsure about posting this, because it’s not one of my usual topics. I’m so glad you liked it, and I thank you for the compliment 🙂 I really did have to work to find a niche for myself, and it was totally worth it. Not to mention, I can now be very convincing when I’m encouraging Jacob to travel to more distant tracks… Like, say, New Jersey? Heehee.